And so, that is the story of how the last meal of my trip began – my last meal but not my last write-up. There is one more post to come which I have decided to leave to last for reasons that I will explain when it goes up. 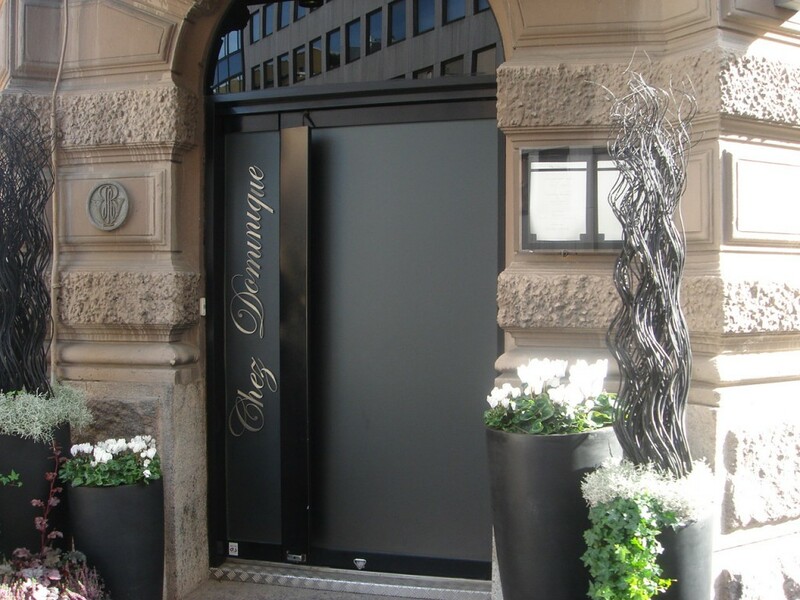 But back to Chez Dominique, which as already mentioned is a two star Michelin restaurant and is ranked 21 in this year’s San Pellegrino 50 Best Restaurants Awards. The brainchild of Chef Hans Välimäki, the restaurant is well known for its ‘sauna’ dish, a concoction of tar and silver birch which replicates the smell of a sauna. Unfortunately this was not available during my visit but I happily settled for the ‘surprise’ six course tasting menu (with the restaurant kindly throwing a few extras) and the matching tasting wines (prices listed below). To kick things off were a variety of ‘crispbreads’: octopus with rice, duck skin, olive and two different types of mushrooms. The duck skin was crispy and delicate, with a lovely light flavour of duck skin; and of the mushrooms, one was slightly sweet and similar to a thin crunchy waffle. The other crispbreads were also tasty. 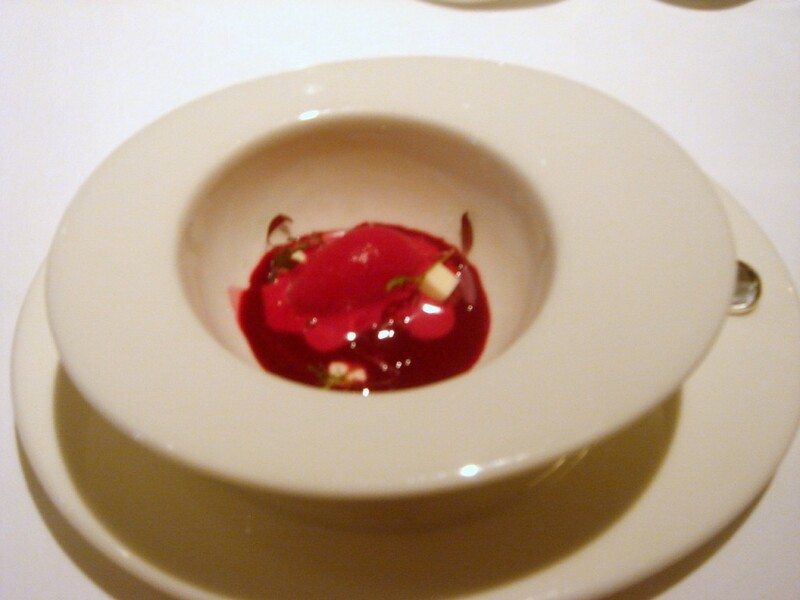 The first amuse bouche entitled ‘Borsch’ was a beetroot ice cream which was exquisite. Deep with flavour, it was sweet and fresh. It was served with ‘pickle spaghetti’ which gave off a crunchy texture; red cabbage gazpacho, which with its touch of tartness accentuated the ice cream; and cream fraiche jelly which helped to cut the richness of the beetroot. Next was salmon served with a drizzle of salmon soup, dill and dill oil. 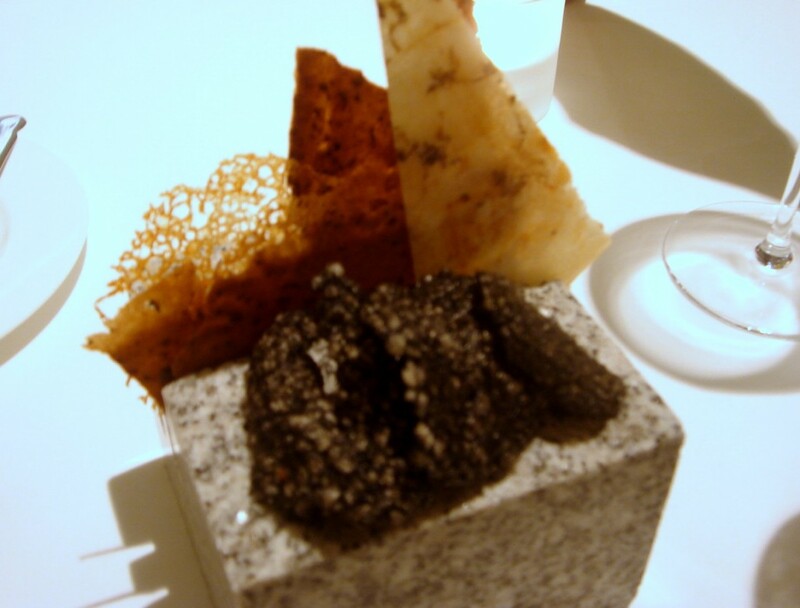 There was great harmony in this amuse bouche with all the flavours working well together. The salmon soup left a wonderful aftertaste that lingered on the palate. 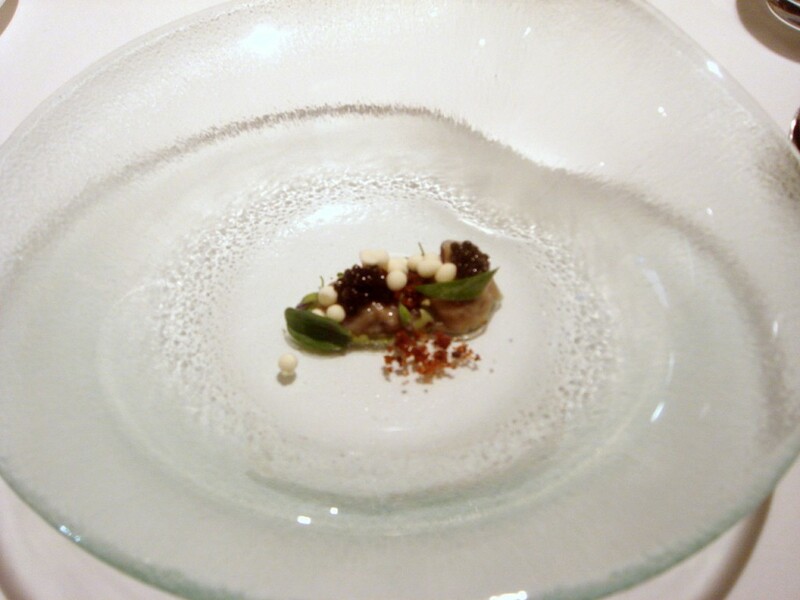 To follow were pickled oysters with oyster leaves, oyster flowers, caviar and horseradish which ‘wowed’. The pickled oysters were flavoursome and not too sour, and the horseradish, in the form of an icy cold crème fraiche (frozen using a liquid nitrogen technique), dazzled the tongue and enhanced the loveliness of the oysters. A sprinkling of crumbed caramelised malt bread added crunchiness to the oysters for further contrast. To homemade breads, and there was a selection of (from the bottom to the top in the picture) rye, olive and a mix of wheat and rye flour. Beautifully seasoned, the olive was the best of the three with its crispy exterior and soft centre. 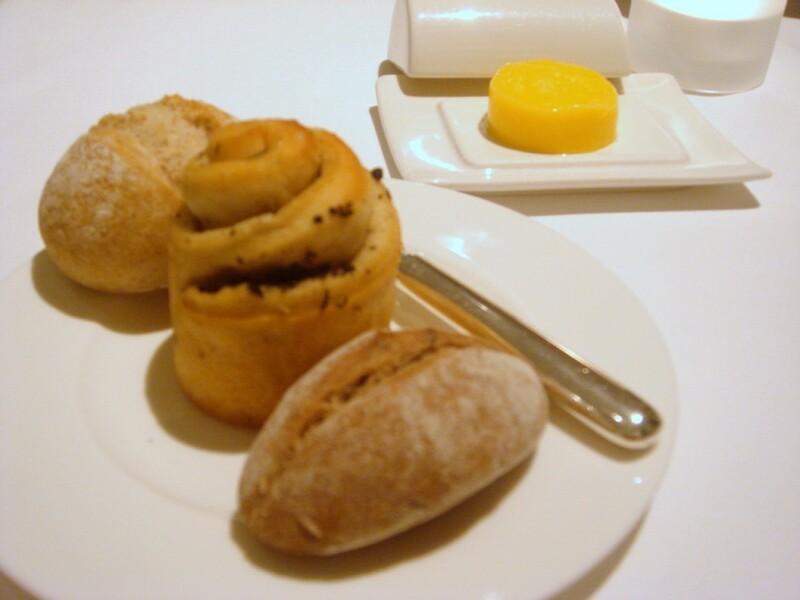 The other breads were tasty, although the crusts were not particularly crunchy. 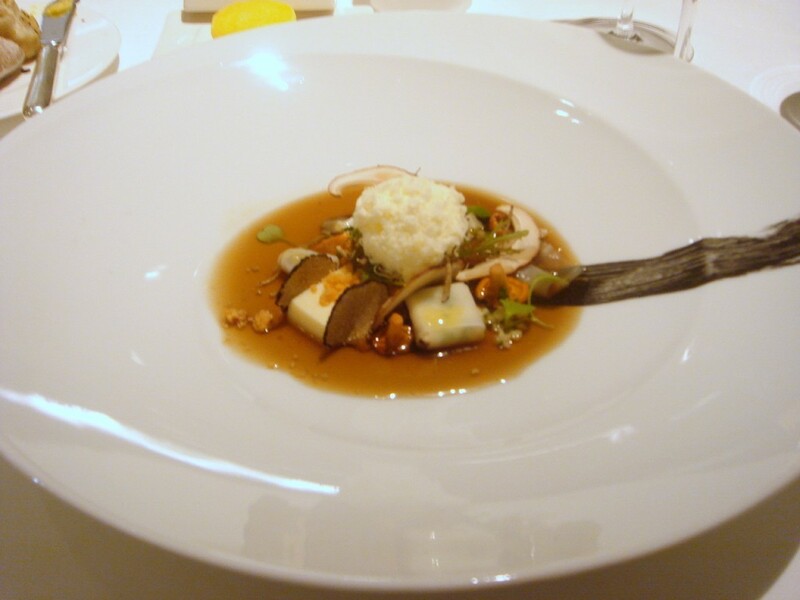 The first course was an assortment of cauliflower (cream, jelly and ravioli) with parmesan and mushroom (wine: Becherelle 1998, Château de la Roche-aux-Moines, Savennières). 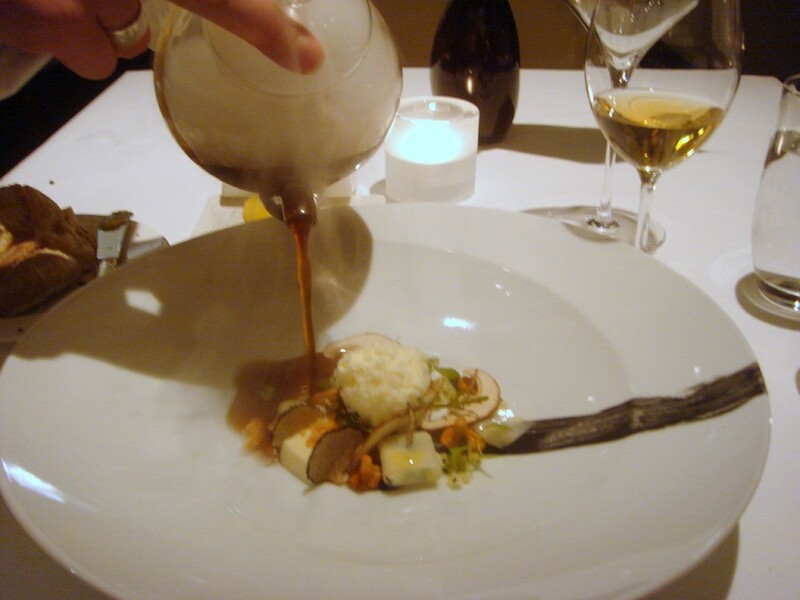 Served at room temperature, it also came with truffles, truffle puree, a mushroom consommé which was poured over the dish at the table from a teapot with a steaming dry ice effect. I had expected this dish to be warm, but nevertheless it was dazzling. The consommé, intensely reduced, was rich with flavour, and the cauliflower cream which was paired with truffle cream was rich and luxurious. The ravioli, filled with tiny pieces of cauliflower, was a little dull on its own, but it worked well with the parmesan which was in the form of a mousse topped with parmesan shavings. 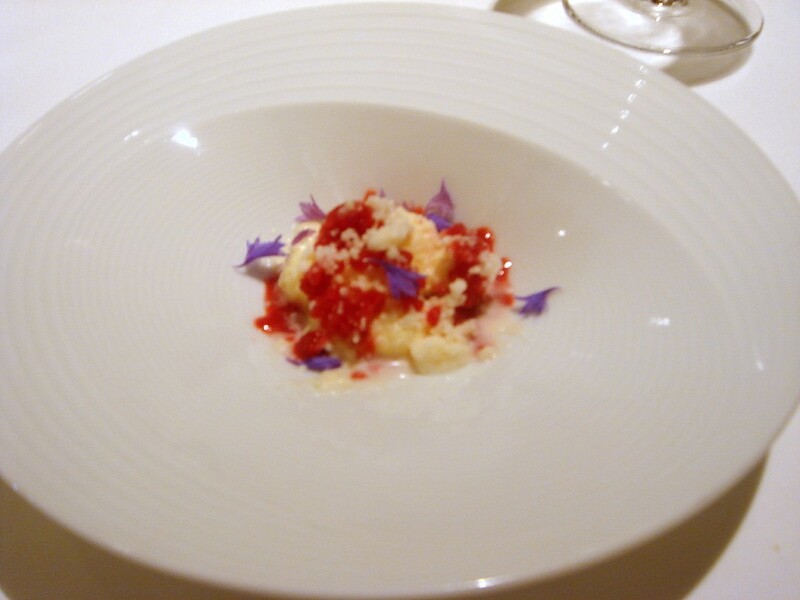 Texturally, the jelly was also an interesting addition, and overall, there was a wonderful harmony to this dish. Foie gras, with a cream of foie gras and foie gras powder was also extremely tasty (wine: Riesling Altenberg de Bergheim 1997, Marcel Deiss, Alsace). 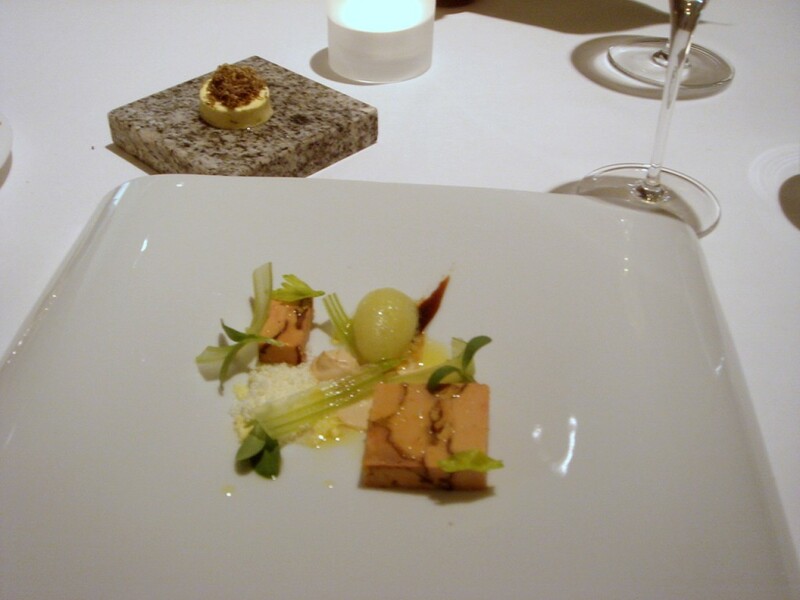 It was served with a celery sorbet, which although sweet, did not loose any of the taste of celery and worked well to cut the richness of the foie gras. There were also slices of celery which did not necessary add to the flavour of the dish, but the use of some aromatic truffle shaved over the truffle butter that accompanied the warm brioche was a wonderful touch. 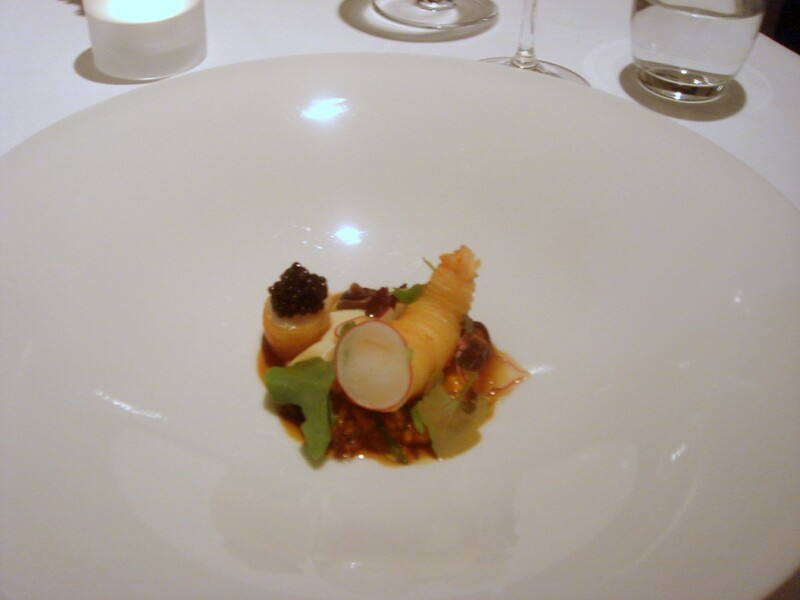 The next course of langoustine (wine: Sancerre Le Chêne 2006, Domaine Lucien Crochet) turned out to be the most exciting dish of the evening. 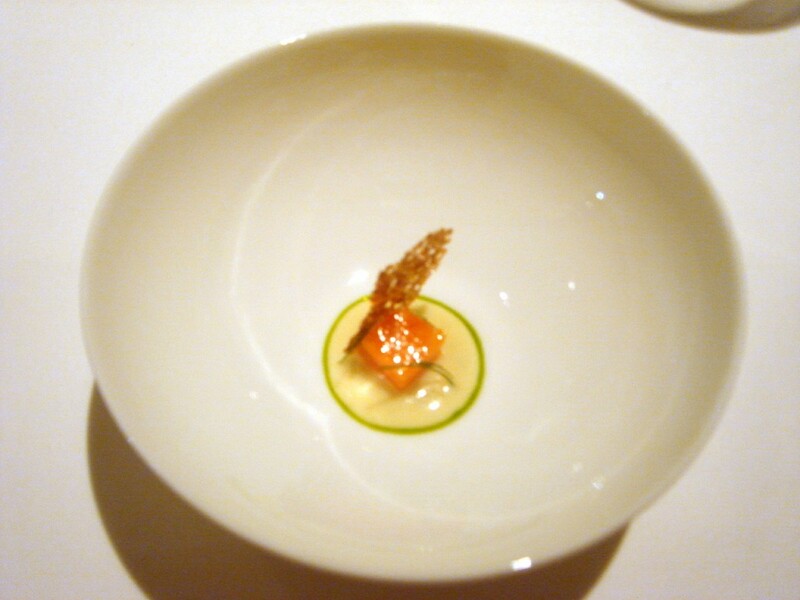 The langoustine which had a good, firm texture was wrapped in a thin crispy potato casing, and served with a ‘lobster bolognaise’ which tasted like a tomatey bechamel sauce with shredded lobster. It was resplendent with the taste of tomatoes and homemade goodness. To complete the dish was a lovely dollop of caviar. This dish was cleverly done with an earthiness and wholesomeness to it which was highly enjoyable. 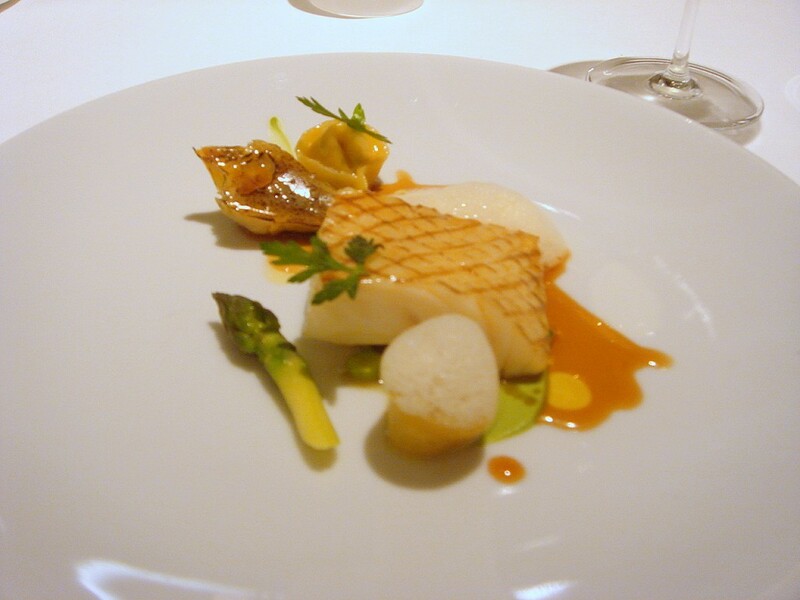 Turbot with Jerusalem artichoke (wine: Puligny-Montrachet 2002, Château de Puligny-Montrachet) was also excellent. The texture of the fish was silky smooth, and there was a firmness to the flesh which was similar to that of meat. Cooked medium, it delivered a powerful fish flavour. The fish was accompanied by some lovely artichoke foam, crunchy peas, spinach, Jerusalem artichoke ravioli and a liquorice sauce which was outstanding. Made from a reduction of turbot bones and veal and chicken stock, it was beautifully reduced to a thick consistency and finished with a hint of liquorice, not so much that it overpowered the dish. Hans would later explain to me that liquorice is a favourite with the Finns. We also had a discussion about the artichoke ravioli in this course, which I thought had too much bite to them, almost as if they were half raw. This level of doneness is considered by many to be the technical interpretation of al dente, and by this standard the ravioli was al dente, although I personally would have preferred a few more seconds of cooking to reduce some of the hardness in the pasta. Otherwise, this dish was excellent. An interpretation of the classic Finnish dish, Vispipuuro, was next. Basically a whipped porridge (usually made with semolina) and topped with lingonberries, this is the best time of year for it as these berries are in season. This version used red currants instead, and the porridge was whipped with milk extracted from parsnip roots and wheat. It was finished with rye flowers and tasted like a luxurious rice pudding full of creaminess and hints of sweet fruitiness. The meat course was Anjou pigeon (wine: Savigny-Les-Beaune Aux Petits Liards 1998, Domaine Doudet) which was succulent, juicy and so tender that it sliced like butter. It was served with a delicious truffle potato, mushroom puree, white bean puree, a coco ‘pastilla’ which included pigeon confit, slices of truffle and a beautifully reduced madeira sauce. 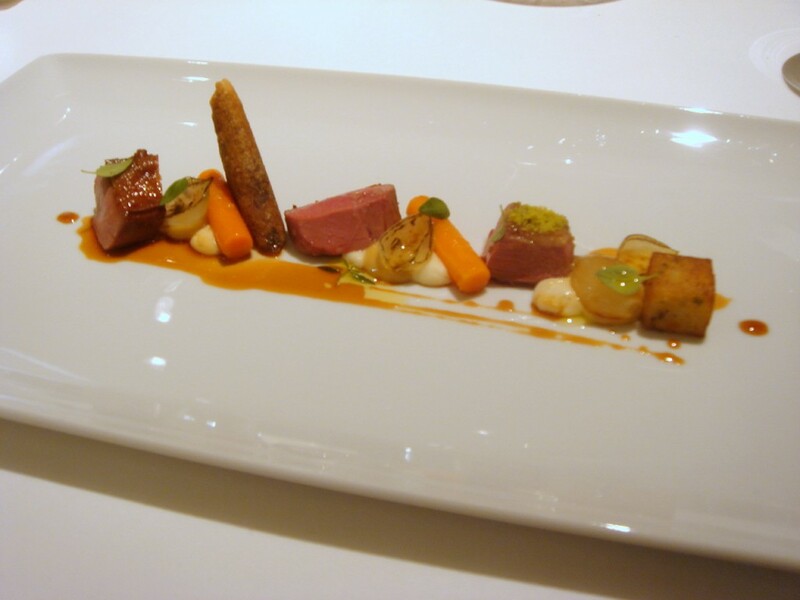 There were also some caramelised carrots and onions, and some of the pigeon had been sprinkled with a pistachio and almond powder which further enhanced the pigeon. The wine choice was also outstanding. 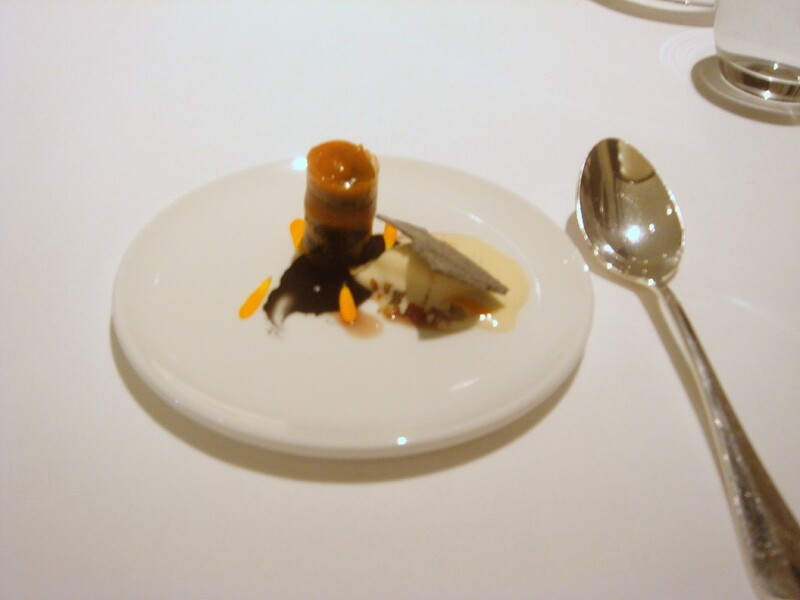 The pre-dessert was a pumpkin and liquorice concoction. The centrepiece was a ‘tower’ of pumpkin puree with liquorice, served with liquorice puree, caramelised pumpkin seeds and vanilla ice cream. The texture of this dish was light and creamy with bursts of crunchiness from the seeds. Again the use of liquorice was subtle. 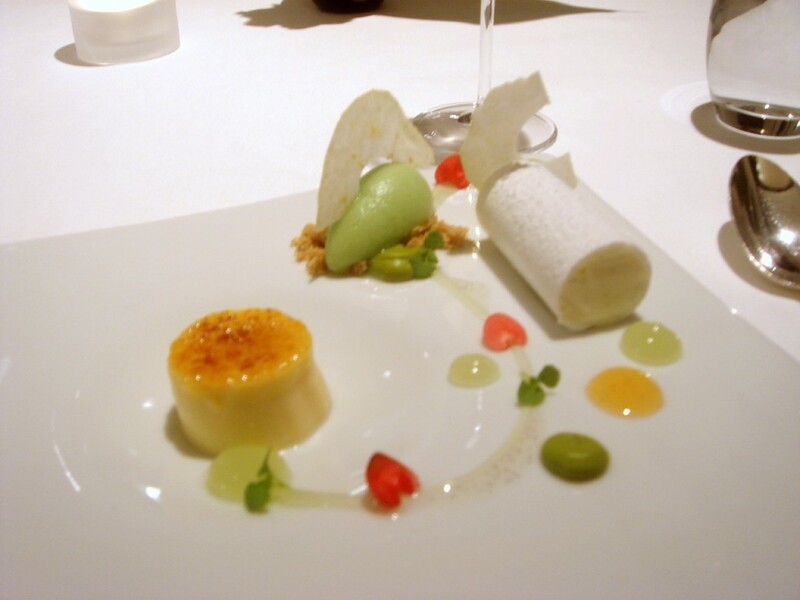 A rosemary crème brûlée (wine: Schloss Gobelsburg Grüner Veltliner 2007, Langenlois) was accompanied by a granny smith apple sorbet, apple pavlova and drops of apple sauce, caramel sauce, pistachio cream and vanilla oil. There was a refreshing zing to the sorbet although the crème brûlée was a little eggy. Otherwise, the dessert eaten as a whole was pleasing and light on the palate. To the last dessert, a chocolate mousse with chocolate ganache (wine: Noé Sherry 30 Y.O., Gonzáles Byass) was decadent and rich. 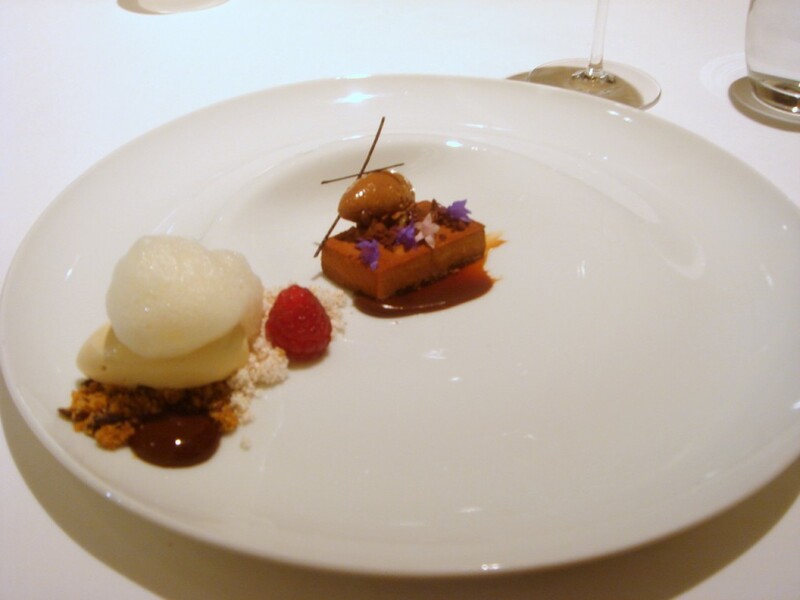 There was also some milk ice cream served over a bed of almonds and coco beans and topped with anise foam, and a chocolate, toffee and olive oil emulsion. The ice cream offset the richness of the chocolate, and this dessert was a fitting finale to a lovely meal. Service was wonderful and delivered with a smile and lots of warmth. It was professional, but also relaxed, and the restaurant did not make a fuss about my luggage. Chef Hans also took time to talk to the various patrons and spoon sauces over the dishes which I thought was a nice touch. The cooking at Chez Dominique was flawless, as would befit a two star Michelin restaurant. But there was also a gracefulness to the food as well. The flavours of the ingredients harmonised wonderfully together, like the intricate interplay of the folds of layers of beautiful fabric which come together to form a seamless dress. This was an elegant and sophisticated meal. Add to that a luxurious white, beige and dark blue décor as backdrop, perfect lighting, and this made for a truly beautiful dining experience.